NVIDIA GameWorks is the latest announcement made at the GeForce event in Montreal which empowers developers with new tools for developing and enhancing their games and optimizing better experiences for PC gamers. The NVIDIA GameWorks program is part of NVIDIA’s latest strategy to empower developers with tools that ease in game development providing rich and quality gaming experience to PC gamers. This is done through the help of 300 visual effects engineers from NVIDIA who will be dispatched to developers across the globe offering library of SDKs, technology and algorithms and finally developer tools. Part of this strategy includes three new SDKs – Flex, GI Works and Flame Works. 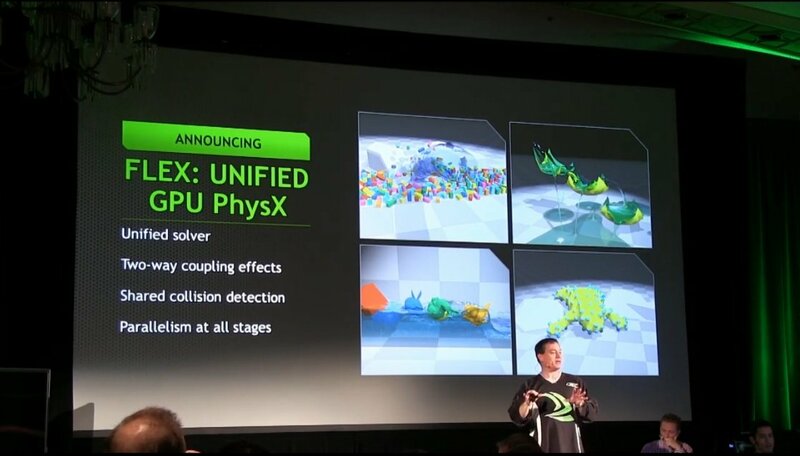 NVIDIA’s Flex is the latest unified GPU PhysX system which allows developers to use a combination of rigid body and fluid simulations. In past game development processes, it was hard to let the two simulations work aside each other due to their complex nature but NVIDIA’s Flex with the right tools would unify this process allowing the use of both rigid body and fluid simulations. Image is courtesy of HardwareZone! Next up is the new GI Works SDK which is the short term for Global Illumination Works which allows real-time global illumination in any scene required. Currently, developers use pre-backed global illumination effects in their scenes placing several light sources in a particular place which is a burden for developers and at the same time, it gives off a non-dynamic presentation. This is solved with the use of real-time global illumination which is more realistic and offers a more dynamic experience to gamers. Last up is the Flame Works SDK which includes a film-quality volumetric effect solution to render flame and smoke. 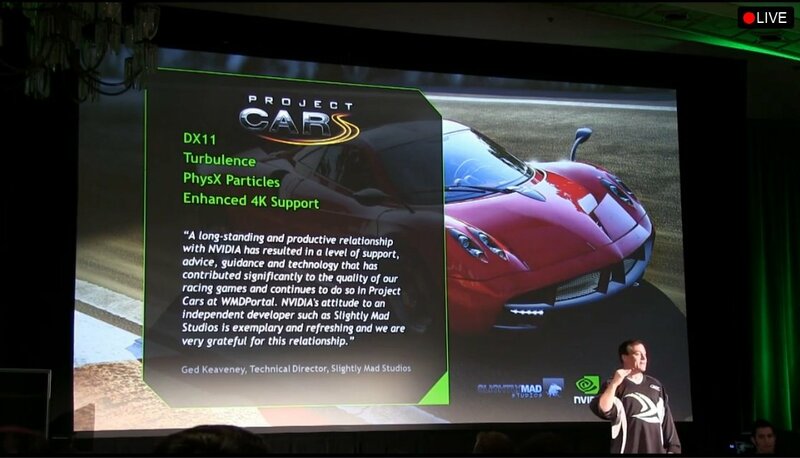 NVIDIA is adding these features along with various other effects in alot of upcoming titles such as Batman: Arkham Origins, Witcher 3: The Wild Hunt, Assassins Creed IV: Black Flag, Watch Dogs. Some of the new titles such as Project Cars and the multi-million dollar funded Star Citizen are also offering rich NVIDIA Turbulence and NVIDIA PhysX and PhysX Particles support plus HBAO+, TXAA, Cloth Simulation and many more to name. 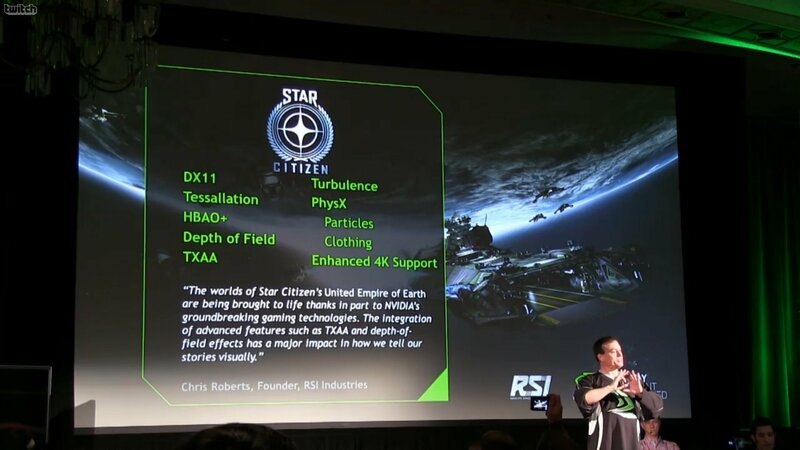 All of the NVIDIA GameWorks titles would offer enhanced with 4K resolution support which seems to be the next generation trend for enthusiast level PC gamers and is also the aim by AMD with their Radeon R9 290X GPU as demonstrated by the previews posted just a few hours ago. 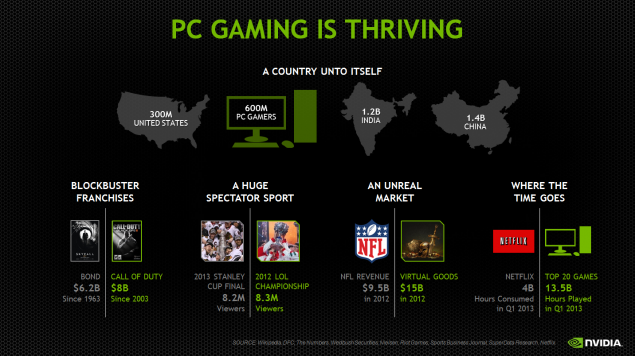 NVIDIA and AMD both offer great set of enhancements which in the future would help PC as a gaming platform to flourish. 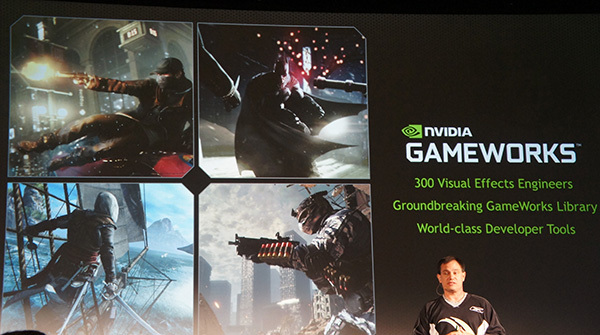 Expect more announcements by NVIDIA over the next couple of days. In addition to these announcements, NVIDIA also unveiled their new Holiday bundle for the GeForce graphic cards which would be available by the end of October, more information on those here.